The Triumph Street Triple is among the most popular motorcycles for the British bike maker in India, and globally as well. The key to its success was that the Street Triple offered a package of everyday usability, exciting performance and brilliant handling dynamics which wasn’t witnessed in the middleweight segment before. No wonder, ever since its debut in 2007, the Street Triple has been among the best middleweight street bikes on sale globally, with sales crossing 50,000 units. It had received minor cosmetic and mechanical updates in 2013 but was feeling left out both in terms of performance and, more importantly, technology with respect to its rivals. Triumph had to respond and they have done so by riding in the 2107 Triumph Street Triple range. Apart from cosmetic and mechanical updates, the 2017 Street Triple also gets the benefit of electronic goodies. To make the Street Triple range appeal to a wider audience, it is now offered in three variants - Street Triple S, Street Triple R and Street Triple RS. We had been invited to ride the top-spec Street Triple RS in Barcelona to see for ourselves how much of a difference the updates have made on the new British bike. Triumph emphasised to us that the 2017 Street Triple RS is an all-new motorcycle and not an updated model. But one look at the bike and you will think that it looks similar to the older machine. But, look further and the design differentiations appear: the headlight is much larger than the older bike and the RS version also gets LED DRLs that do look good. The fuel tank lines and the Street Triple design DNA has been maintained while the tail section and exhaust muffler is much more compact. The styling isn't going to get any awards for the 2017 Street Triple RS but we must say it is much more pleasing on the eyes than the previous model. The biggest talking point of the new motorcycle is its new heart. The bike is powered by a new larger 765cc displacement three-cylinder engine which is based on the Daytona 675R's motor. The new motor delivers 123PS at 11,700rpm and 77Nm at 10,800rpm, making the RS version the most powerful Street triple ever manufactured. Triumph engineers have increased the bore and stroke of the new engine. The increase in bore has hiked the displacement while the longer stroke has endowed the mill with more torque. Triumph claims that the powerplant features 80 new parts. The changes include new crank, pistons, con-rods and balancer shaft. The aluminium cylinder barrels have also been Nikasil plated to reduce frictional losses. We must point out that the Street Triple that was sold in India developed 79PS as opposed to the 106PS on the international-spec bike. Triumph India officials said that for the 2017 Street Triple range, they plan to get the full-power version to India and more clarity on the actual power figures will be revealed during the India launch. The first two gear ratios have also been revised and are shorter than the older transmission to make the engine more tractable at lower revs while providing good acceleration. The new engine has to comply with Euro4 emission norms and it also features a revised exhaust system and air box. The exhaust has been repositioned for better mass centralisation and is also lighter by 1.7kg compared to the older bike. The other big news is the addition of electronic goodies. The Triumph Street Triple RS features 5 ride modes - rain, sport, race, rider and track. It has four level traction control settings – road, rain, track and off. The ABS also gets three modes – road, track and off. As you see, Triumph has well covered the electronic shortfalls of the older bike. The rider can also customise each ride mode along with his preferred traction control settings and ABS. Another noticeable addition is the TFT all-digital instrument cluster, which is loaded to the brim with details. 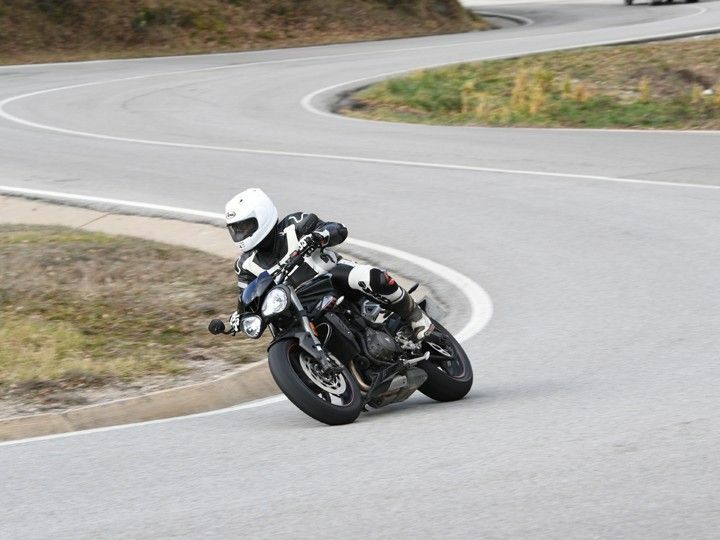 The Triumph Street Triple RS is the first motorcycle whose display swivels. Riders can change the angle of the screen so that the display is clearly visible for riders of varying stature. There are three themes for the display with an auto-contrast function that adjusts the display brightness depending on ambient light. Triumph has also provided new switch cubes with 5-way joystick control which is ergonomically positioned and easy to use even when on the go. The Street Triple RS also features a quickshifter as standard, alongwith self-cancelling indicators. Fit and finish levels of the motorcycle are of the first order. The chassis of the Street Triple was among the highlights of the bike and the 2017 version gets the same twin-spar frame as seen in its predecessor. Rake angle has been slightly reduced (23.9 º) to improve the handling dynamics of the RS version. Saddle height is high at 825mm, as opposed to 800mm on the older model. The ride started at 7am and it was biting cold but the triple-cylinder motor came to life with enthusiasm. The first thing one notices is that the whistle sound of the intake is considerably lower than the older motor. Feed in revs and the Triple starts sounding better with a throaty roar. But if you want a louder sounding motorcycle, you have the optional Arrow exhaust on hand. On the narrow back roads, the low-end power delivery of the motorcycle was impressive. The first two gear ratios are also shorter, to provide good acceleration and dial in some throttle, and the bike shoots off the line. Peak torque of 77Nm is made available at 10,800rpm but almost 70 per cent of the torque is on tap at just 4,500rpm and this means no matter what gear you are in, just a twist of the wrist was enough for overtaking. The Triumph Street Triple RS gets ride-by-wire system which offers crisp and precise throttle response. Power delivery is also fed in a smooth and linear manner and only once you cross 8,000rpm does it become more manic. We were coasting at triple digit speeds on the Spanish Autovia without a hint of gruffness or vibes from the motor and refinement levels of the new motor is impressive. We did encounter some traffic while passing through towns and the slip-assisted clutch meant that clutch action was light and easy to use. All ride modes offer full power but the power delivery ascends from rain mode onwards. As the tarmac was cold, I stuck to sport mode and found the electronic intrusion smooth. Power delivery was in a controlled manner and I once misjudged my corner entry, but while I panicked, the ABS did its job without any drama. Once on the open highways, I switched to race mode and the throttle felt more responsive. The traction control intervention was milder and the front wheel did salute the Spanish tarmac on few occasions when the throttle was whacked open. The Street Triple RS feels like a docile machine up to 7,000rpm and anyone can ride it, but once over it, the bike changes character and turns into a vicious and entertaining motorcycle. The bike gave great feedback through the chassis on the stunning mountain roads and I was relishing the corners despite the cold asphalt. The bike tips into corner easily and manoeuvring it in city traffic was also effortless. But the Street Triple RS came into its element when we rode it on the Circuit de Barcelona – the Catalunya MotoGP race track. Sweeping corners, tight corners, chicanes or whatever you threw at the new Street Triple RS, it dismissed them with authority. The Showa BPF (big piston fork) and Ohlins STX40 monoshock unit at the rear (both fully adjustable) play their part to perfection in amplifying the handling dynamics of the bike. The fact that it weighs 2kg lighter (166kg) than its predecessor meant that you could flick the bike around without much effort. Triumph engineers have also added a new gullwing swingarm to increase torsional stiffness and this has improved the anti-squat performance on the newer bike in comparison. Another vital element in the brilliant handling dynamics of the Street Triple RS is the Pirelli Diablo Supercorsa SP tyres that offer leech-like grip and encouraged me to lean the bike further on the track. The Street Triple RS is sprung on the stiffer side to offer great handling prowess. This, though, makes the ride quality stiff on the road and the handlebar juddered while riding over broken tarmac, and it worsens even further on Indian roads. We feel on our roads the R and S versions will make for better everyday bikes as they will have a plusher ride. The brilliant handling proficiency of the motorcycle was matched well by the performance of the motor on the circuit. In track mode, power delivery was lively and it allows 50 per cent slip before the traction control or the ABS comes to your rescue. The quickshifter worked like a charm and the slipper clutch meant hard downshifts didn’t unsettle the bike while entering into a corner. I was clocking close to 230kmph on the main straight which ends into a second gear chicane and that means braking performance had to be excellent. Gladly, Triumph has equipped the Street Triple RS with top-spec Brembo M50 4-piston radial monobloc calipers that offer brilliant retardation and great feedback through the levers. The brakes shed speed swiftly and showed no signs of fade despite 30 minutes of hard track riding. High speed stability is impressive but the bike offers no wind protection and it was a task to hold onto the bars at speeds close to 200kmph. The Triumph Street Triple RS is, without a shadow of doubt, among the best middleweight streetbikes that I have ridden. It sets a new benchmark both in terms of road and track performance for street motorcycles in its segment. And while doing the same at utmost comfort, as after an almost 9 hour ride none of the journos were complaining! While the old motorcycle was easy to ride with enjoyable performance, it didn’t have that captivating aura. The new 2017 Street Triple RS offers that heavy dose of adrenaline and such is the addictive nature that you want to keep riding it more and keep grinning. The electronic package has been brilliantly integrated into the new motorcycle, while the cycle parts perform in absolute harmony to deliver an unforgettable motorcycling experience. The tall seat height and the stiff ride quality are the only two flaws that I could point out in an otherwise splendidly packaged motorcycle. The base 2017 Triumph Street Triple S will compete against the upcoming Kawasaki Z900 in the Indian two-wheeler space. The Street Triple RS finds competition against Italian rivals like the Ducati Monster 821 and the upcoming MV Agusta Brutale 800. Triumph India will launch the base Street Triple S in India first by June/July, and as for the Street Triple RS, expect it to hit Indian tarmac by late 2017. The Street Triple RS will be assembled in India and we expect a price of around Rs 10 to 12 lakh, ex-showroom. Pricing will be a key factor for the Street Triple RS as its Italian opponents command more snob value in India and have gorgeous styling.